Lab5 Consultancy Ltd is the only company, based in Malta, specialised in Quality Assurance. 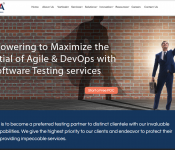 Lab5 was founded by a group of software engineers with a passion for software testing and quality assurance. With over 10 years of testing experience each, we have worked for companies in Malta, Germany, the United Kingdom and the United States in domains as diverse as media, television, publishing, banking, and online gaming. Our senior consultants have worked for a large variety of clients including BBC News, Channel 4, Nativ TV, Macmillan Publishers, Betfair and RBS Group. Our clients usually struggle in delivering quality products in an acceptable timeframe. We are equipped to carry out root-cause analysis of problems being experienced by our clients, create a roadmap which the client can follow in order to address those problems and, if required, provide specialised services to help the client implement the roadmap. We offer a wide range of services including life cycle analysis, automated testing solutions, build pipeline and test infrastructure management, specialised testing training, system testability reviews, performance testing, recruitment of testing talent and outsourcing.